Authored by Łukasz Kwoska (Szakulus) on Jan 27 2019, 1:32 AM. I've experimented with touch handling priority a little-bit, but I didn't gent anywhere. Also I believe, that implementing this fix by reordering could lead to regressions and/or difficult to find bugs. So I've decided to move the scale handles. 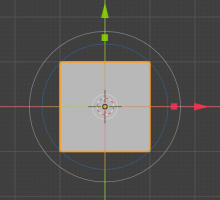 I've moved them in-between circles as having them outside of outer circle imho moved them a little-bit to close to translate arrow heads (see attached screenshot). William Reynish (billreynish) added subscribers: Campbell Barton (campbellbarton), William Reynish (billreynish). Thanks for this. I tested it - seems like a market improvement. @Campbell Barton (campbellbarton): Can you check and commit if ok?